NEWS ITEM ON HURRICANE MICHAEL ISSUED BY THE BAHAMAS DEPARTMENT OF METEOROLOGY FORECAST OFFICE SECTION 12PM WEDNESDAY 10TH OCTOBER 2018. AT 11:00AM EDT, THE EYE OF HURRICANE MICHAEL WAS LOCATED NEAR LATITUDE 29.4°NORTH AND LONGITUDE 86.0° WEST OR ABOUT 145 MILES SOUTH-SOUTHWEST OF PANAMA CITY FLORIDA OR 65 MILES WEST-SOUTHWEST OF APALACHICOLA FLORIDA. MICHAEL IS MOVING TOWARD THE NORTH-NORTHEAST NEAR 14 MPH. A TURN TOWARD THE NORTH IS EXPECTED THIS AFTERNOON OR TONIGHT. A MOTION TOWARD THE NORTHEAST AT A FASTER FORWARD SPEED IS FORECAST ON THURSDAY THROUGH FRIDAY NIGHT. 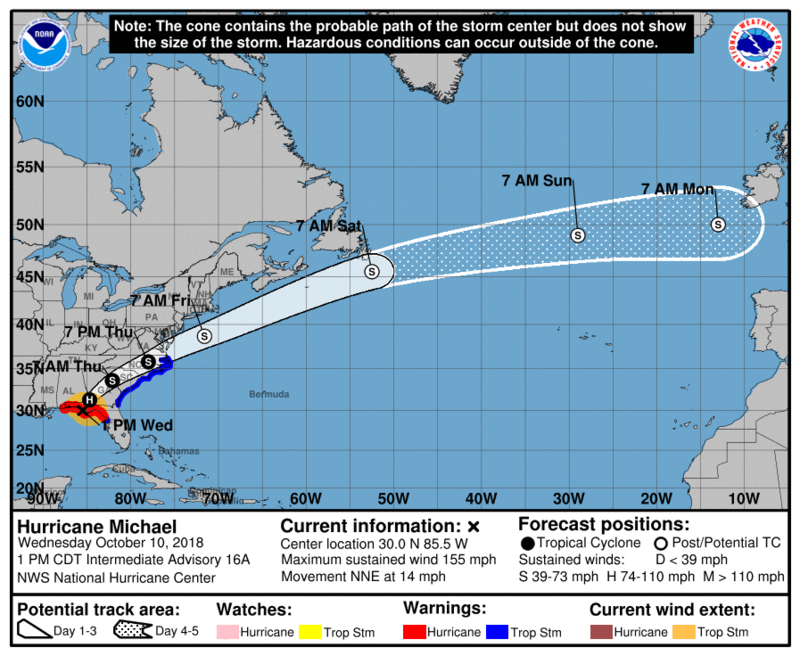 ON THE FORECAST TRACK, THE CORE OF MICHAEL IS EXPECTED TO MOVE ASHORE ALONG THE FLORIDA PANHANDLE THIS AFTERNOON, MOVE NORTHEASTWARD ACROSS THE SOUTHEASTERN UNITED STATES TONIGHT AND THURSDAY, AND THEN MOVE OFF THE MID-ATLANTIC COAST AWAY FROM THE UNITED STATES ON FRIDAY. DATA FROM AN AIR FORCE RESERVE HURRICANE HUNTER AIRCRAFT INDICATE THAT MAXIMUM SUSTAINED WINDS ARE NEAR 145 MPH WITH HIGHER GUSTS. MICHAEL IS AN EXTREMELY DANGEROUS CATEGORY 4 HURRICANE ON THE SAFFIR-SIMPSON HURRICANE WIND SCALE. SOME STRENGTHENING IS POSSIBLE BEFORE LANDFALL. AFTER LANDFALL, MICHAEL IS FORECAST TO BECOME A POST-TROPICAL CYCLONE ON FRIDAY AND STRENGTHENING IS FORECAST AS THE SYSTEM MOVES OVER THE WESTERN ATLANTIC.